Who uses a water treatment service company? Water is an essential element in every company in the UK – from radiators, to hot and cold running water, to air conditioning systems, to cooling towers and evaporative condensers, water runs through the veins of all businesses. These water systems, although often hidden behind walls, in ceiling voids and in basements, are vital to the smooth and efficient company operation and, without regular maintenance from a specialist in water treatment services, their potential to fail can not only prove costly, economically, but can also have serious public health implications. All companies, however large or small, can avoid problems associated with their water systems – the build up of scale, corrosion of metal pipe work and the growth of harmful legionella microbes (responsible for outbreaks of the potentially fatal Legionnaires’ disease) with the use of a regular, professionally administered water treatment service. Whatever your requirements, Direct-Tech Solutions’ highly qualified engineers will use their expertise to find the water treatment service that is right for your company. What are the benefits of using qualified technicians? When it comes to water treatment services it is ALWAYS in your best interests to call in qualified technicians. At Direct-Tech Solutions, our engineers are highly skilled and qualified in all aspects of water treatment. Services can be tailored to the specifications of individual clients to ensure longer equipment life and economic savings, and to provide officially sanctioned safety assurances. It is interesting that, in the UK, industrial boiler failures (and all the associated costs) due to in-house treatment of water systems, rather than calling in external specialist engineers, average one per day; it is similarly interesting that NO correctly maintained cooling tower has ever been implicated in any outbreak of Legionnaires’ disease. Having all your water treatment services professionally dealt with by Direct Tech Solutions’ highly qualified team of engineers, leaves you free to focus on the running of your business, confident that your water systems comply with current legislation and best practice guidance. Why do you need a Water Treatment Service? Water treatment services are vital in order to reduce both costs to your company and risks to your employees. Poorly treated water can lead to scaling or corrosion, which in turn will have a negative impact on efficiency. Incorrectly treated water can also be a breeding ground for bacterial growth – at best, water can become unsafe to drink and, at worst, Legionnaires’ disease can be a fatal consequence. Within the UK, it is a company’s responsibility to ensure that water in the work place is safe and it is a legal requirement to carry out legionella risk assessments of all industrial water systems. Recent legislation has considerably increased fines and given courts far greater sentencing powers for companies found to be flouting health and safety laws. In 2012, for example, holiday park operator, Pontins, was fined after two visitors contracted Legionnaires’ disease. One of them later died. Although the fine was a nominal £1000, it is interesting to note that the sentencing judge said that, if the company had been solvent, a fine of £500,000 would have been levied. It is clear that serious breaches of health and safety controls with regards to Legionnaires’ disease can result in substantial fines. Investing in professional water treatment services not only offers protection against any such outbreak but, should any problems occur, despite taking every precaution, then, having evidence that risk assessment and management programs are in place can significantly reduce a company’s liability. Direct-Tech Solutions’ wide range of professionally administered water treatment services cover all aspects of water hygiene and include a comprehensive legionella risk assessment and management program, developed in accordance with UK Health and Safety Executive L8 guidelines. When should I use a water treatment company? It is vitally important that companies have a complete maintenance program in place, where qualified engineers perform a wide range of water treatment services on all types of water system. It is a legal requirement that a legionella risk assessment is carried out at least every two years, in order to comply with L8 legislation. As well as the legionella risk, pseudomonas bacteria can also be present in water systems and, if left untreated, can cause a build up of slime, blocking and corroding pipe work, and leading to significant repair costs. It is, therefore, also essential to check and clean all water systems and storage tanks at least once a year and possibly more often, depending on factors such as stagnation, sedimentation and tank position. At Direct-Tech Solutions, our highly skilled engineers are qualified to deliver the water treatment service specific to your requirements; our rigorous sample testing and expert cleaning methods help ensure that your company’s water systems are free from harmful bacteria and pose no risk of damaging either the fabric of your buildings or the health of your employees. How do I contact Direct-Tech Solutions? 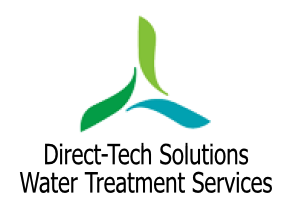 If you require more information or details for any of the water treatment services Direct-Tech Solutions offer, please do not hesitate to call or email.